Because this is not the Caribbean. Or is it? 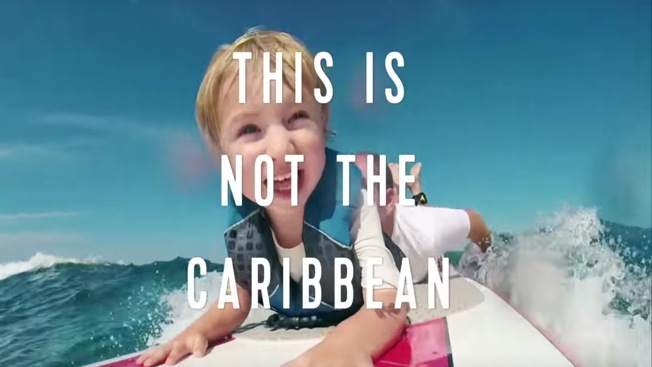 Mullen Lowe positions Royal Caribbean as something of an anti-cruise line in its first campaign for the brand since adding the assignment in May. Vivid colors and good vibes permeate sun-splashed, quick-cut clips, which use phrases like "You are not a tourist" and "This is not a cruise" to hone Royal Caribbean's message for millennials and others seeking immersive, adventurous getaways. In fact, "seeking" is the salient theme, and "Come seek" is the new positioning. The ads focus on the overall experience of exploring exotic destinations beyond the ship itself. Indeed, shipboard activities are largely de-emphasized (one overhead pan makes a ship vessel look like a high-rise beachfront hotel) in favor of shots from various ports of call. That's probably a wise move, given the raft of food poisoning and more tragic disasters involving cruise ships in recent years.
" 'Come seek' is designed to attract the next generation of cruisers," Royal Caribbean CMO Jim Berra tells AdFreak. "For them, trying new things, taking the road less traveled and sharing their experiences via social media is core to how they enjoy life. We all recognize the generational shift that is occurring, and we have a great opportunity to become their vacation brand of choice." The media strategy, devised by Mullen Lowe affiliate Mediahub, places five-second video edits in single commercial pods, broken up by spots from other brands, with full 30-second Royal Caribbean commercials running later in the same programs. A Periscope activation, streaming live from a cruise, and animated billboards in major U.S. markets are also in the mix. "The 'seeker' mindset cuts across demographics, but the largest concentration is in the maturing millennial segment," says Berra. "Their perception is that you can't have unique and unexpected experiences while cruising. We're tackling that misperception head on. The campaign is all about giving them a preview of what they can look forward to humbly bragging about when they sail with us." Overall, "Come seek" succeeds fairly well at achieving that goal. The percussive pacing, while not exactly new, is effective, and there's a refreshing lack of the usual cruise-ship hype: We're spared swingin' moonlight parties on the Lido Deck, and shown actual streets, bays, wildlife and citizens of the Caribbean. Oh, wait. "This is not the Caribbean," we're told. "This is the Royal Caribbean." That's either awkward or distinctive, depending on your point of view. Ultimately, all cruise-line advertising is about enticing folks to take long trips on big boats. It's not easy charting a new course for that.